For starters, my younger sister had her first baby, a cute little boy. Which is GREAT. Except for that whole part where he was 4+ weeks early, is sick, has a hole in his heart, probably has Down's, and my sister ended up with a C-Section, and isn't doing so hot herself.... THAT was Friday morning. Friday afternoon, I looked in the backyard and saw both my boys, pants around their ankles, taking care of business. IN FRONT OF WHO KNOWS WHO. So I promptly slid open the back door, clapped my hands, shouted "Boys! Stop that right now! ", walked off the deck, and slipped. At which point my ankle rolled beneath me, shooting pain through my knee, causing me to fall to the ground. Which is the exact first impression I wanted to have on my new neighbors. Meanwhile, I was trying to be stern with my boys while at the same time trying not to cry like a baby as I crawled back on the deck and into the house. 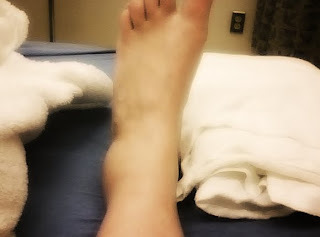 Luckily, it's not broken, although the doctor said that sprains typically hurt worse than breaks, and gave me a prescription for Vicodin. Now I just have to figure out what shoes I should wear to show off my lovely ankle brace. Oh, and I have crutches. pffhhht. I used them for about 10 minutes before my armpits started bleeding and I decided I'd rather limp/crawl along before using those things again. Then on Friday EVENING, my other sister broke her tailbone. Obviously, our family has a thing for hospitals. *My sister and baby are doing okay. Thank goodness for modern medicine.